What do you do when you need to produce a large-scale event and know you really need to work with event volunteers to make it all happen? C) do you take on event interns and volunteers to help fill out your team? You might think it’s more risk and stress than it’s worth but trust me – I’ve been there! 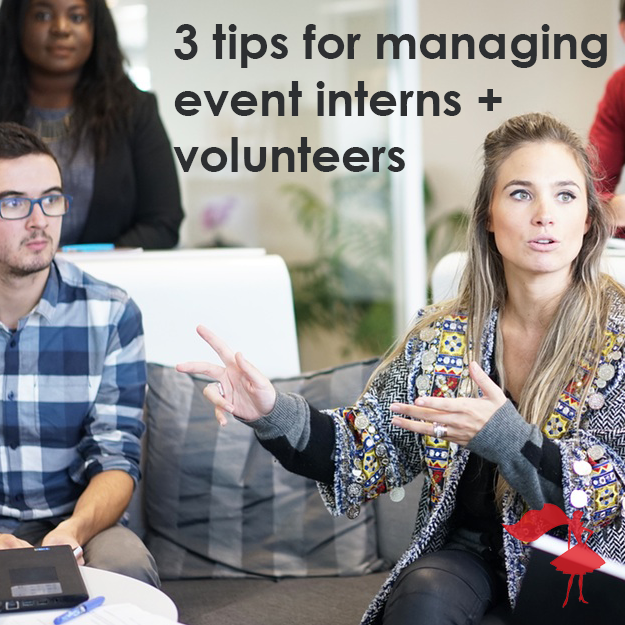 To make sure your event is a success, follow my 3 top tips about bringing on volunteers and interns and what I’ve learned over time of what they need from you as their manager and mentor. 1000 + guests. 100 performers. Planning, promotion, VIPs to impress, tech, stage management, plus a million other little details. Let’s not even mention risk management and crowd control. All this with a core team of only 6 members and a teeny tiny budget. I still struggle with this sometimes but you have to trust that your volunteers or interns are capable of getting on with the work you have set. REMEMBER: you don’t have time to micromanage. I often found that when I give people a little freedom and the ability to use their initiative, they exceeded my expectations. They also felt like a valued member of the team. They realized that they were being given serious responsibilities and I made sure they knew how important their work (no matter how small the task) was to the overall project. With a little guidance and training, as a result, we had a very dedicated team who were willing to go the extra mile. While your volunteers and interns aren’t (necessarily) long-term permanent members of your team, you still should make an effort to get to know them. Personally, I was pretty good at this – partly because it helped me learn to let go and trust them. It also meant I knew where to assign individuals to make the most of their talents…I found some diamonds in the rough and because I knew they were capable, I was able to give them additional responsibilities, which took a huge load of stress and work off of me. Taking the time to get to know people makes them feel valued and improves morale and commitment. If you are struggling with making time to talk to volunteers or interns, my top tip is to assign the role of volunteer or intern coordinator to a member of your permanent team. That way, they’ve got a primary pointperson on the team that they feel comfortable to ask questions and report to for accountability. Everyone has different motivations and to get the best from your team, you need to know what they want to get out the experience. Some of my volunteers just wanted hands-on experience and a good reference to help them with future job opportunities, some wanted the chance to be promoted or even a shot at becoming part of the full time team. Offer incentives such as further training or the opportunity to build contacts. I found giving volunteers individual job titles (instead of just calling them an intern or volunteer) made some of them very happy – they knew they had an important role to play in the project and knowing they could be promoted and be given more responsibilities made them work harder. So, did you notice any themes? Making your volunteers and interns feel like valued members of the team is crucial. It increases commitment and improves their quality of work. You can’t expect people to commit to your project until you invest in them. Trust me, it’s worth it – there’s NO WAY my event would have happened without my volunteers. They saved me money, time and a whole lot of stress, plus they allowed my team to take the event to the next higher level. Want to onboard interns fast and minimize stress? The time is now to pre-order The Apprentice Program curriculum for your interns for the Fall 2016 semester. Just $75/intern per semester for custom-crafted training, guaranteed to get your interns up to speed with the way your firm plans and produces events. Just click the button below!